I have been all over the world as a photographer, and have photographed weddings abroad as well. As much as I adore traveling, at this point in my life with two small kids who I am obsessed with I don't typically travel for weddings. I mainly photograph weddings on Vancouver Island. That being said, there is the odd time, for the right people, the right place and the perfect timing, that I will accept weddings off the island. Please contact me directly for these inquiries. I typically photograph most weddings on my own. Whether that be 100% solo or with an assistant. I honestly work quite well solo. Many have commented that I am some sort of photo ninja. I take these compliments seriously. 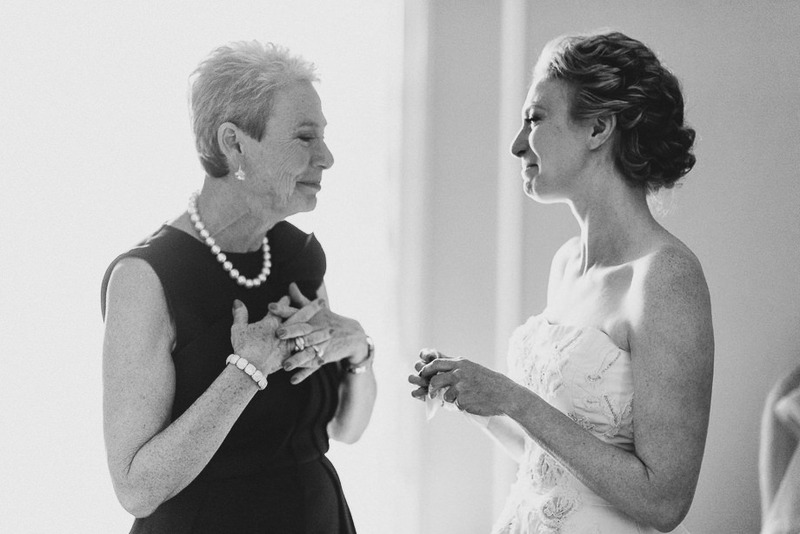 I have photographed hundreds of weddings and find it helpful for me to stay fully immersed in moments and in your wedding day, it is easier if I am on my own. Sinking into your family and scenes. In saying that, I do have a talented second photographer that I have started adding to my days when the schedule or particular wedding needs it. (should it be impossible for me to be in two places at once etc) I will custom quote for these weddings. Do you want to be fed at dinner? I do have celiac disease so as much as I appreciate the offer, depending on location and their sensitivity to dietary restrictions I am unable to eat at buffets. However, a lot of places are becoming more understanding of the disease and take it very seriously so if they offer special plating for CD without cross contamination and created safely I would much prefer to eat at the same time as you (so I don't miss amazing moments after dinner). That being said, if it is not possible to be guaranteed a safe meal, I am happy bringing my own food and will likely bring it anyways. Living on Vancouver Island, I have pretty much seen it all for weather, but no I can't control the weather. To be honest, I have a soft spot for rainy weddings. True, they make things a little more challenging (especially if your venue is the beach or outdoors) however, it makes a day pretty memorable and if you can tough it out and roll with the day, embracing it for what it is... you just may have an amazing celebration after all. My clients can handle the rain! I can handle the rain. I ask that you please have umbrellas ready for you and your wedding party and we will do our very best! 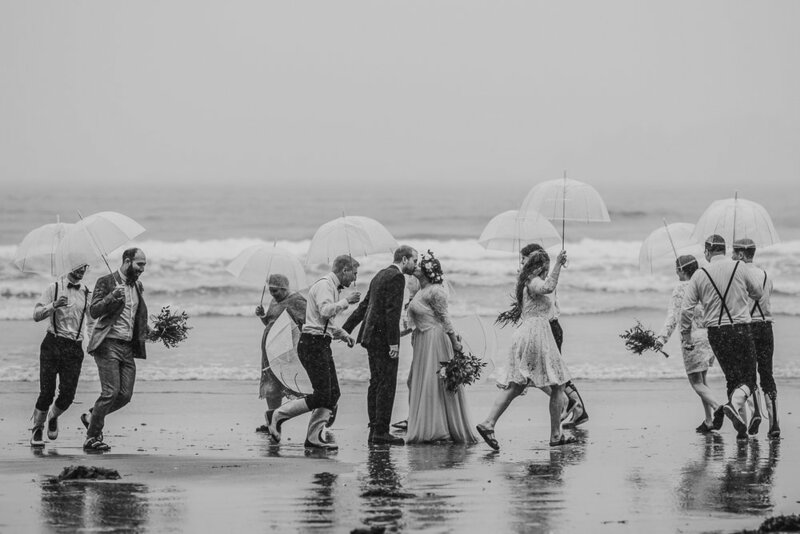 I have photographed many, many weddings in the most insane rain storms and although I may have collapsed after in a puddle of rain gear and wet camera equipment I will do my very best to ensure that your images reflect your once in a lifetime day. I take my job very seriously and am determined to capture your day despite what is happening with Mother Nature. when will i see photos? I like to post at least one image the day after your wedding. I actually love for your friends and family to see the first images of your wedding be your professional ones! You worked so hard on your wedding and put so much love into it, someones iPhone pics shouldn't be the first to showcase your day! Your full online wedding galleries will be uploaded 6-8 weeks after your wedding date. Please don't just leave this up to the wedding planner, or your venue! When possible I actually WANT to be involved in timing your wedding. If the wedding is outside having it closer to sunset might be ideal to get the most beautiful images. I would also love to have input on where the ceremony might face so the light could be in the ideal spot depending on time of day and shade/shadows/harsh light etc. We will work together to ensure your wedding timing is exactly what it needs to be for best results. I also love to have at least an hour with the bride and groom for portraits and if we are adding in wedding party, 1.5-2 hours is ideal. Family photos typically should take less than 15 minutes... speaking of family photos.... I absolutely want to and will take family photos! I typically only focus on immediate family as the extended shots can get fairly time consuming and hard to orchestrate. I offer digital files from your wedding day "digital negatives" basically. You will receive a curated selection of these from your wedding day as outlined in your package. Typically approximately 700 images from 6 hours of coverage. The "copyright" remains with the photographer always. However, the images will be yours to share and print and cherish forever. Well my initial reaction is always yes. However, I really feel like for the most amazing images to happen there has to be a wonderful connection. If my images speak to you, give you goosebumps, bring tears to your eyes or if you can see yourself in my images... we may likely be an amazing match. If my words and images make you want to roll your eyes and think "no thanks!"... I'd suggest finding someone else. I only take a limited amount of weddings on per year, and if you think we'd be a perfect match I'd love to hear from you. DO WE NEED A SHOT LIST OR MUST HAVE PHOTO LIST? In short, no. Almost even please no. While I appreciate the sentiment I do find it challenging and even detrimental to be looking off of a "list" to try and recreate moments. I am much more comfortable and in my element going with the flow of your wedding day and capturing all the beauty along the way. I am constantly looking for all the subtle details, the looks, the connections and what is naturally unfolding through out your wedding day. I will have locations scouted out, and an idea of what will make the best images from your wedding. Working off of a list isn't my style. It doesn't mean it is wrong or bad, it just truly isn't me. More my style is you maybe pointing out before hand "I'm obsessed with my sister, she is my everything" I will make sure to get some images that help tell that part of your story. I'm not a list person. I'm happy to share others full wedding galleries so you can get an idea of what I might capture should that have been your wedding. The worst part of wedding lists like this is that if my eyes and focus is on a piece of paper , I will not be fully immersed in your moments and may very well miss something special. DO YOU OFFER DISCOUNTS OR DO ELOPEMENTS? While I do not offer discounts I am a bit more flexible in the off season (outside of May-September) I offer elopement pricing for weddings under 10 guests. I love mid week elopements, or remote elopements or incredibly small and intimate affairs. I find them to be incredibly memorable and romantic and love exploring new ideas for these. 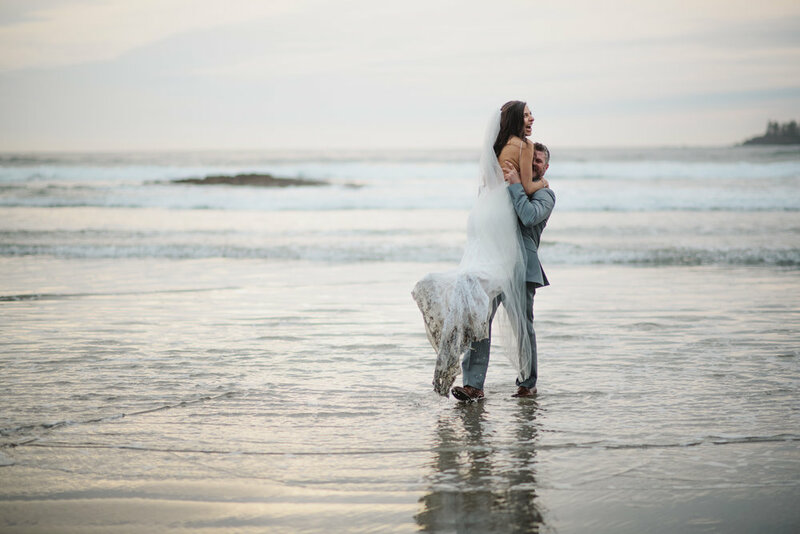 I am happy to talk with you about how to make your dream island elopement come true.